EJIL: Talk! – The ICC’s Impact on National Justice: Can the ICC Prosecutor Catalyze Domestic Cases? Home EJIL Article Discussion The ICC’s Impact on National Justice: Can the ICC Prosecutor Catalyze Domestic Cases? We assessed the extent to which the prosecutor’s office had pushed forward the investigation and prosecution of ICC crimes relevant to its preliminary examinations in these countries. We interviewed government officials, investigating and prosecuting authorities, judges, members of civil society groups, journalists, and representatives of diplomatic missions and UN agencies, about 140 people in all, as well as staff in the ICC prosecutor’s office. Of these four countries, trials of relevant crimes have, for the most part, only taken place in Colombia. And there – where we looked at one aspect of the ICC preliminary examination, the unlawful killings that military personnel officially reported as lawful killings in combat, known as “false positive” killings — proceedings against high-ranking military officials have been marked by prolonged delays, in spite of hundreds of cases against low- and mid-level soldiers. There are persistent and stubborn obstacles to trying the most serious crimes before national courts. 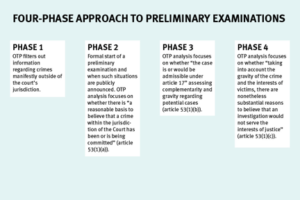 Objective factors — such as the peace process in Colombia or the cross-border nature of the Georgia-Russia conflict — also place significant constraints on what the preliminary examinations can achieve to spur national justice. And the prosecutor’s office, with only 13 staff members in its preliminary examinations unit, has limited resources for this work. In Colombia, the involvement has yet to prove effective to overcome equivocal political will nationally to prosecute high-ranking officials — a significant challenge — but it has kept the need for accountability for “false positive” killings on the table. It has also been a factor in developing relevant prosecutorial strategies, expediting progress in cases against mid and low-level defendants, and countering one legislative proposal that might have undermined prosecutions. A key challenge is to avoid manipulation by government actors. The office needs to open up space for national authorities to act, while being willing — and being seen as willing — to conduct its own investigations if they do not, provided the ICC’s other jurisdictional requirements are met. This is a tough balancing act, with no easy solution. But, in Guinea, the ICC staff’s frequent missions — more than a dozen — appear to have assisted it in determining how to effectively press for progress when national investigations slowed. The office also needs to verify information provided by government authorities, and visits to a country may open up additional sources of information. Across our case studies, the key obstacle to further progress in national prosecutions was an absence of political will by officials to support cases. One specific way the office can exert stronger pressure in the face of this resistance is to identify benchmarks for national authorities, as it did in Guinea, for example, the need to visit the crime scene and interview key witnesses. In Colombia, by contrast, more general discussions with national authorities appeared not to have convinced some officials that the ICC would be prepared to open investigations, lessening the office’s influence. Fourth, increased transparency — particularly through effective use of local and international media—can have benefits.